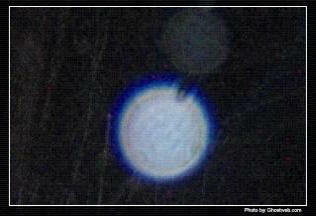 Ghost orbs vs environmental orb related: Evaluating ghostly orb anomalies. Most often we fail to evaluate an orb that is related to the environment due to lack of understanding on the energy that is generated by the spirit of the dead. 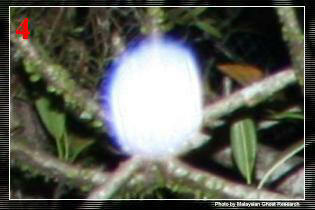 An orb related to energy has a particular characteristic that differentiates it from the dust orb. 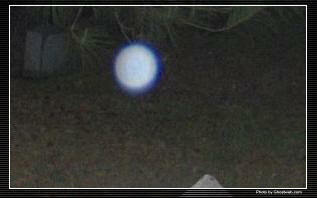 Orbs in general are common since they become the basic nature of all creatures. In fact, orb dust are also related to weather patterns. 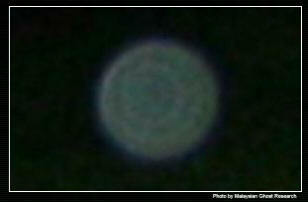 During the dry season, we tend to capture orb dust that will be transparent. 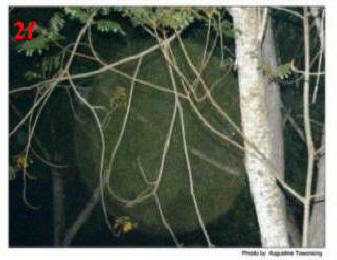 Meanwhile, during the wet season, solid-like orbs may be captured as well during adverse weather conditions. The importance of non-ghost orb research. Why is the understanding on orbs that are related to the environment so important? In fact, I have enlightened myself through my personal research findings on orbs dust, which is the opposite of real ghost orbs that are generated by the environment. In order to understand deeper the energy patterns that are related to spirits, first we have to learn to understand the basic existence of our surroundings that generate non-ghost orbs. This is important to create an awareness, the basic key to eliminate unnecessary mistakes when we evaluate anomalies. 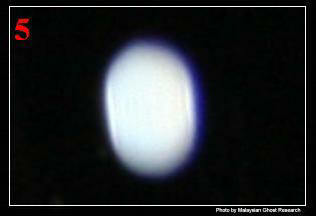 In fact, we will fail to evaluate anomalies that are printed on film if we fail to understand the existence of orb dust. This basic field investigation is mostly ignored by the non-professional ghost investigators that leads them to proclaim the orb dust to be the orb generated by the spirit entity. Why I write this article is to share my experience on the research of non-ghost orbs to find out exactly the orb dust patterns that are related to weather pattern conditions and share the findings, after I changed my field investigations into non-ghosts orb research in order to capture as much as possible the orbs dust photos that are related to weather patterns. In fact, this research not only has enlightened me but also has helped to increase my awareness on the surroundings of the field investigation, whereby the awareness has helped me a lot on the process of evaluating anomalies. Therefore, this article may also in turn will help others to conduct ghost field investigations more professionally that eliminates unnecessary mistakes. In this article, my discussion will be limited on orbs dust characteristics that are related to weather pattern conditions - dry season that tends to produce orbs dust, wet seasons and atmospheric weather conditions such as surroundings temperature changing to produce mist. Furthermore, this discussion only centers on the Malaysian climate that may have similarities with other places. Furthermore, the discussion is based on my experiences on the experiments that I have done during my field investigations. My evaluation is based on the digital photograph that was taken using Canon EOS350D (8.0 mega pixels) with external light that can light up up till 105 feet. Mostly photos are taken at night with an external light. Furthermore, I would like to share that the high resolution photo is very important for us to evaluate the ghostly anomalies that are printed on film, since the images can be zoomed up to 800% without distorting the image of anomaly that in turn will give us the advantage of seeing the details. Perhaps, that may help us to explain the anomaly characteristics as much as possible. 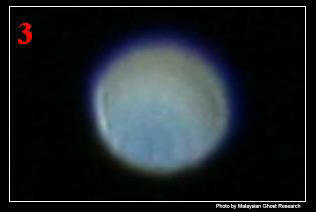 In contrast, the low resolution photo will limit the possibility of having more details on anomaly characteristics since the anomaly cannot be zoomed any further because the image then will be distorted. Examples of orbs dust and their characteristics that are related to weather patterns. The examples of orbs dust below are the most common that will be captured during dry season that are related to dust from the area where we are conducting our field investigations. Furthermore, the dust colour is based on the surrounding that produces the orb dust. The following are good examples of orb dust that most likely will be captured during the dry season in most places in Malaysia. Furthermore, these orbs dust have their specifics characteristics that somehow are similar; transparent and have a demarcated outer ring. 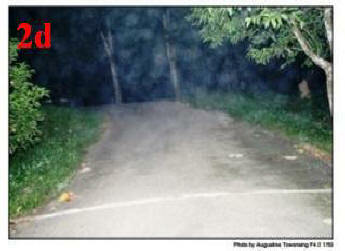 Meanwhile, these two photos below are related to atmospherics weather condition that occurs after midnight. For examples, photos below were captured at about 1.00 to 2.00 a.m, whereas the surrounding temperature had become cool due to the surrounding vegetation that covers the area. These photos actually have captured the thick and thin mist that produce clusters which are considered to be particles of water droplets. 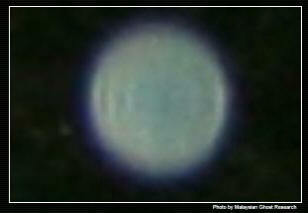 However, these orbs below are related to the wet season or rain. Meanwhile Photos Numbers 4 and 5 are droplets that are stuck on the lens filter that were accumulated due to drizzle. Meanwhile Photos Numbers 1, 1a and 3 are most probably related to dust that have become wet. However, their characteristics still can be recognized as having a similar demarcated outer ring. However, Photos Numbers 4 and 5 also are related to the wet season. By looking at its characteristics, it is suggested that these orbs are stuck on the lens filter and related to water that comes from the drizzle during my field investigation. 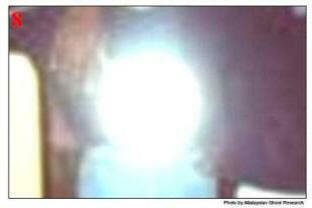 The orbs which look bright are due to bright lights from the flash that are reflected back to the lens. All these should enlighten our understanding of environmental orbs instead of we being stuck with limited understanding of such things. 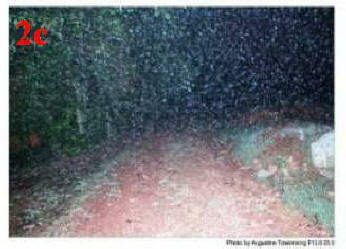 Photos Numbers 1 and 1a are dust that were captured during the wet season. However, the orb dust basic characteristic still can be traced, again having a similar demarcated outer ring. The multi-color characteristic within the orb dust is most probably due to water that contains dissolved dirt. 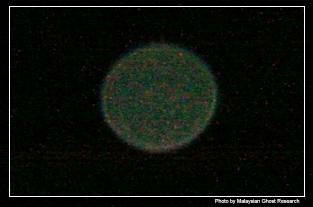 Meanwhile, Photo Number 6 is spherical but is not valid to be a ghost orb because of the presence of the demarcated outer ring minus a blue ring. 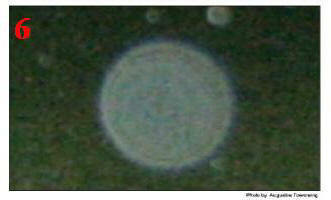 Meanwhile these orbs below are the examples of rain orbs downloaded from Ghostweb.com. In my opinion however, the characteristic of these orbs that stands out actually is not the blue ring but the demarcated outer ring that becomes a similar pattern to all orbs dust regardless of either having substance or being transparent. 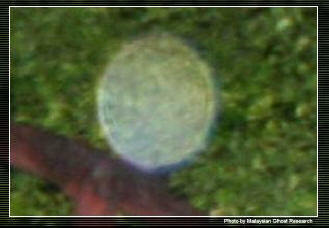 Furthermore, the blue ring seems to also be present in the case of the real ghost orb. 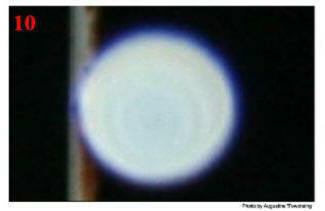 For example, Photo Number 10 has a blue outer ring yet it is qualified to be a ghost orb because the blue ring is not demarcated. 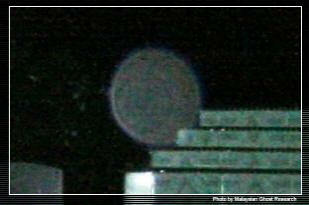 The Characteristics of valid ghost orbs. 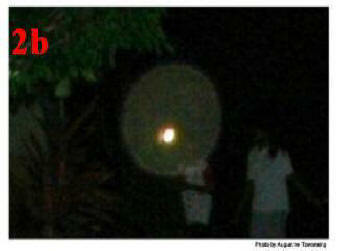 The photos below somewhat are ghost orbs that are believed to be generated by the spirit of the dead. However, the appearance are not the same due to energy differences that are released by the spirit, yet these orbs fall into one similar pattern that we call ghost orb. 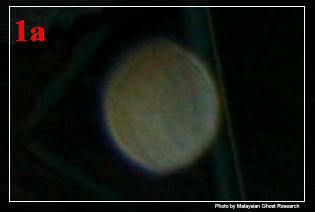 The first photo below almost can be considered orb dust due to its multiple rings. However, close examination suggests that the rings within the orb are thicker compared to the demarcated outer ring that the orb dust has. Therefore, this particular ghost orb is somehow considered to be rare because it has a dimension and the rings are thicker. Perhaps, these multiple rings are probably due to the ripples of the energy vibration within the orb that react to certain conditions or causes. 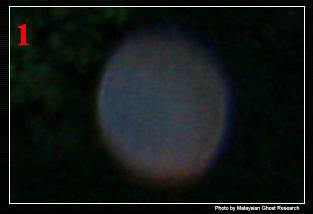 IGHS has pointed it out the characteristics that valid for a ghost orb that mostly have substance, emits its own light source, spherical, have dimension within the orb, Its surrounding become blur due to the energy that being released or expanded. From the examples of orb dust that are related to weather pattern conditions it goes to show that, these orb dust clearly can be mistaken as real ghost orbs if we have no understanding on orb dust patterns. Why I suggest that the examples of the orb dust above is the dark side of the real ghost orbs is because of its similar characteristics that the real ghost orb has. However, all orb dust regardless of its physical appearance have one similar pattern that stands out to be one familiar characteristic, which is the demarcated outer ring. 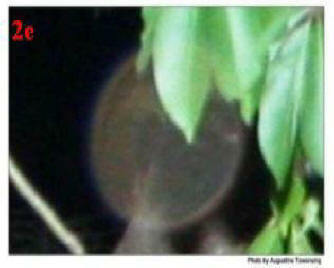 Furthermore, this characteristic does not appear on real ghost orbs because the real ghost orb consists of energy that compressed within the orb. As I mentioned earlier, in order to eliminate mistakes when evaluating ghostly anomalies, we need to increase our awareness on field investigations that not only enlighten our doubt but increases our understanding on orb dust patterns that are related to the environment. Furthermore, close examination on orbs that are related to weather patterns suggests that there is only one basic characteristic of orb dust that stands out to be the basic characteristics that can be used as a guideline to evaluate orb dust, which is the demarcated outer ring. 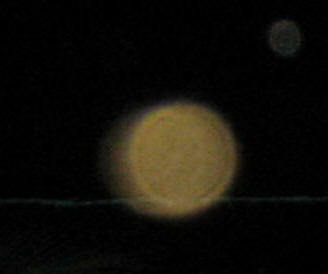 This similar pattern can easily be detected on dust orbs regardless of what caused them, being either transparent or not, spherical or non-spherical. Therefore, to be a professional investigator on ghost orbs, we need to most importantly learn and understand the basic patterns of orb dust. 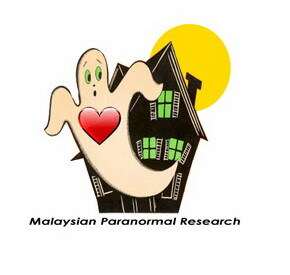 Therefore, I share my findings on evaluating non-ghost orbs that may also in turn will help others to conduct ghost field investigations more professionally that further eliminates unnecessary mistakes.